Blogging has been light lately due to deadlines but I'm starting to emerge from that. Russia's airstrikes in Syria are already a bone of contention, with Russia saying it flew about 20 sorties against at least eight Islamic State targets, but the West and the Free Syrian Army claiming that they struck civilians and areas controlled by the Free Syrian Army or other non-Islamic State groups. Assuming Russia's primary goal is to defend the Asad regime, reports that its targets were in the Homs and Hama regions could confirm this because the regime forces are mainly facing the FSA, Jabhat al-Nusra, and other forces there rather than IS. While the US can hardly object to attacks on Nusra, an al-Qa‘ida affiliate attacks on the FSA could be another matter. And several FSA geoups and allies have claimed they were hit. The map below, from the Institute for the Study of War, shows all the attacks as being well to the west of area controlled by the Islamic State, as do the analysis at ISW's website and an early assessment by Fabrice Balanche at The Washington Institute. If these readings are correct (and with so many competing factions in Syria, the Fog of War is even foggier than usual), then it would seem regime defense is the real motivator in target selections. I will save editorializing until the facts are a bit clearer, but it seems at first glance that Russia's initial strikes are aimed at preventing the further collapse of the regime-controlled zone, which suggests Russia knows exactly what it seeks to accomplish. What is clear is that the situation is transformed and the Russian Bear is in the game. But FSA and other anti-Asad sources are reporting numerous civilian casualties, and one aviation site is suggesting that videos (see below) released by the Russians suggest that the initial strikes may have been with non-guided munitions and may have missed their targets. It would be interesting to know the Russians' own bomb damage assessment (BDA) of the results of day one. The third video below purportedly shows Russian aircraft over a Tajammu‘ al-‘Izza (Gathering of Honor) (FSA-aligned) position. I think the aircraft are Su-24s? A few days ago I noted some doubts about some of the alarmist reporting about the Russian military buildup in Syria, but the hysterical reactions have not only not abated, they've become more shrill. Something close to an apotheosis of paranoid reporting may have been reached. On Saturday, the Israeli "defense and intelligence" (note the quote marks) website DEBKAFile reported "A Chinese aircraft carrier docks at Tartus to support Russian-Iranian military buildup." Now, anyone who has read it even sporadically knows that DEBKAFile has a solid track record of being sensationally wrong; I don't generally cite them here, though I did when they assured us in September 2011 that Qadhafi was still solidly in control in Libya the month before he died in a culvert by the side of a road. It's that kind of a track record. They like to imply they have access to Israeli intelligence, but if so they're being fed disinformation. I have no access to any current classified intelligence, naval intelligence, or overhead image intelligence, so I must fall back on another form of intelligence: analyzing claims in the context of known facts. As John Adams put it, "Facts are stubborn things; and whatever may be our wishes, our inclinations, or the dictates of our passions, they cannot alter the state of facts and evidence." 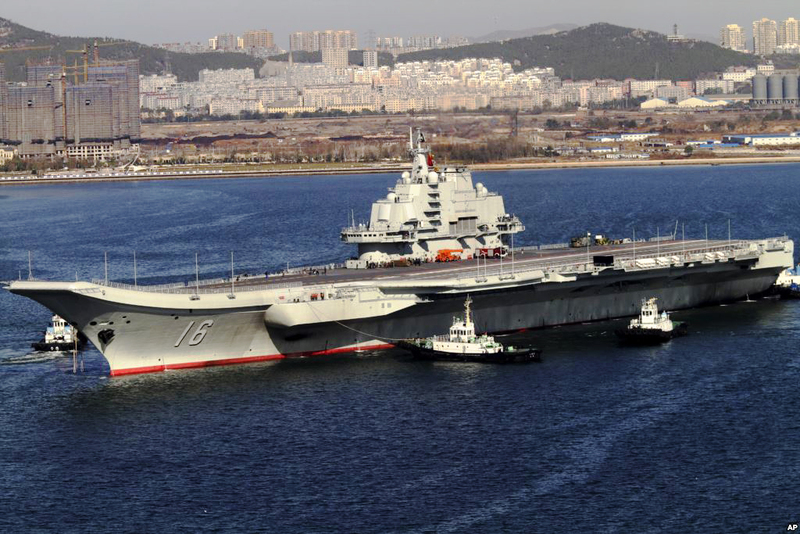 Peoples Liberation Army Navy (PLA Navy) Liaoning (CV-16) is not "A Chinese aircraft carrier"; it is China's only aircraft carrier (though a second is being built). Laid down by the Soviet Navy as the Riga in 1988, renamed Varyag after Latvian independence and taken over by Ukraine with the fall of the Soviet Union, she was towed without operating engines to China and refitted. Its home port is Qingdao in eastern China, though there has been speculation she will be used to enforce Chinese claims in the South China Sea. To reach Tartus she would have to pass through the Strait of Malacca, the Strait of Bab al-Mandab, and the Suez Canal (or take the long way through the Strait of Gibraltar). This cannot be done unnoticed, even by civilian observers. With the US expressing concern about four Russian Su-30 aircraft and 200 Russian Marines, it could neglect to note China's only carrier deployed to the Med? When China itself defines the South China Sea territorial dispute as its primary naval power projection issue? Now it's true there have been other reports that China might join Russia in supporting Syria, and a website that seems pro-Syrian-regime has reported that a "Chinese warship" transited the Suez Canal and Chinese military advisers are en route to Syria, but a "Chinese warship" (some of which have been showing up in odd places like the Bering Strait) is not the same as "China's only aircraft carrier." If only DEBKAFile alone had reported this I'd have ignored it completely. But other media, especially on the political right, are picking up on it. Maybe there is a Chinese ship at Tartus, but if it's the Liaoning, I'll believe in teleportation. Cue Twilight Zone theme: the "Philadelphia Experiment," anyone? Let's mourn and bury the dead and hold off the blame wars until more is understood. Greetings to my Muslim readers for ‘Eid al-‘Adha. ‘Eid Mubarak! 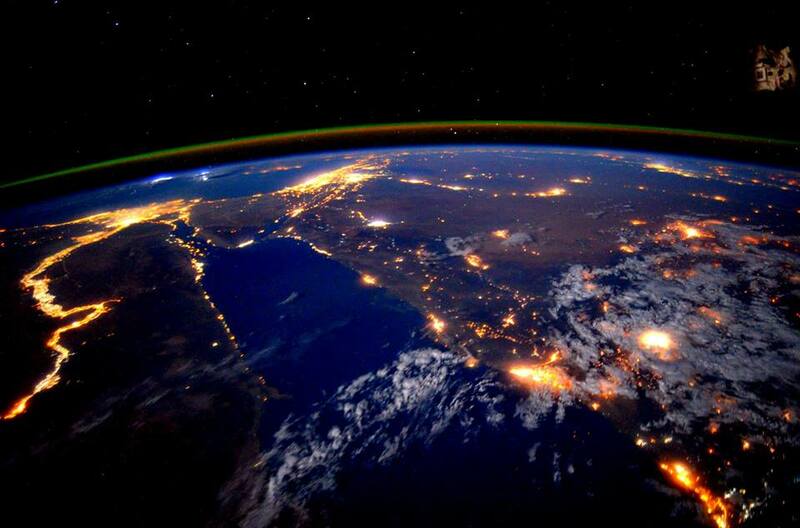 Egypt and the Red Sea area from the International Space Station last night, posted by Astronaut Scott Kelly on Facebook. No doubt that Egypt is still the Gift of the Nile as it has been since Herodotus, but look at how bright Mecca and Jidda are on the first full night if hajj. And how dark Syria is, compared with Israel and Lebanon. 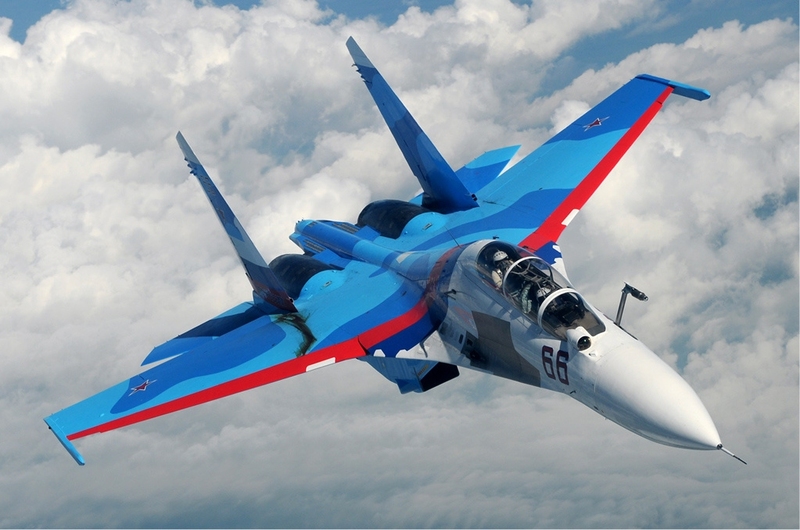 Are the Su-30s in Latakia a Threat to Western Aircraft Over Syria? The US State Department has expressed concern that some elements of the current Russian military buildup in Syria are inconsistent with Russia's stated goals of defending the regime and attacking ISIS. The main concern appears to be the presence of Su-30 fighter aircraft, a modern multirole fighter that carries air-to-air missiles. This, plus the presence of surface-to-air missile systems, raises questions about what requirement there is for air defense capabilities, given that none of the Syrian opposition groups have operable aircraft. This suggests the air-to-air capability might be a threat to US, Turkish, and Allied aircraft operating over Syria. The Russians have reportedly sought to reassure the US, as well as Israel during Binyamin Netanyahu's Moscow visit, that they aren't seeking direct confrontation. The last count I saw, however, indicated that only four Su-30s were present, along with 12 Su-24s and 12 Su-25s, all photographed at a Syrian Naval Aviation base adjacent to Basil al-Asad [officially spelled Bassel Al-Assad in English] International Airport in Latakia. It is not known if all will be deployed there or moved elsewhere, but the Su-24s and Su-25s clearly are ground attack and interdiction fighters, used by the Soviets in Afghanistan and the Russians in Chechnya, and thus appropriate for fighting ISIS, as are the Syrian helicopters normally based there. (Though helicopters have notoriously been used for barrel-bombing civilians). I'm not an expert on Russian air defense doctrine, but I doubt if Russia, undertaking its biggest military buildup since Afghanistan outside former Soviet space, would build what is starting to look like a military base at Latakia and a major expansion of its Navy facility at Tartus without providing perimeter defense of its own forces (the SAMs, tanks, and ground forces it is moving in as well). A lot depends on what the mission of the four Su-30s are, since they have both ground attack and air superiority capabilities. Don't misunderstand me. I'm not defending Russia's jumping in to the Syrian civil war or their attempts to rescue the Asad regime, which they no doubt saw as on the ropes. 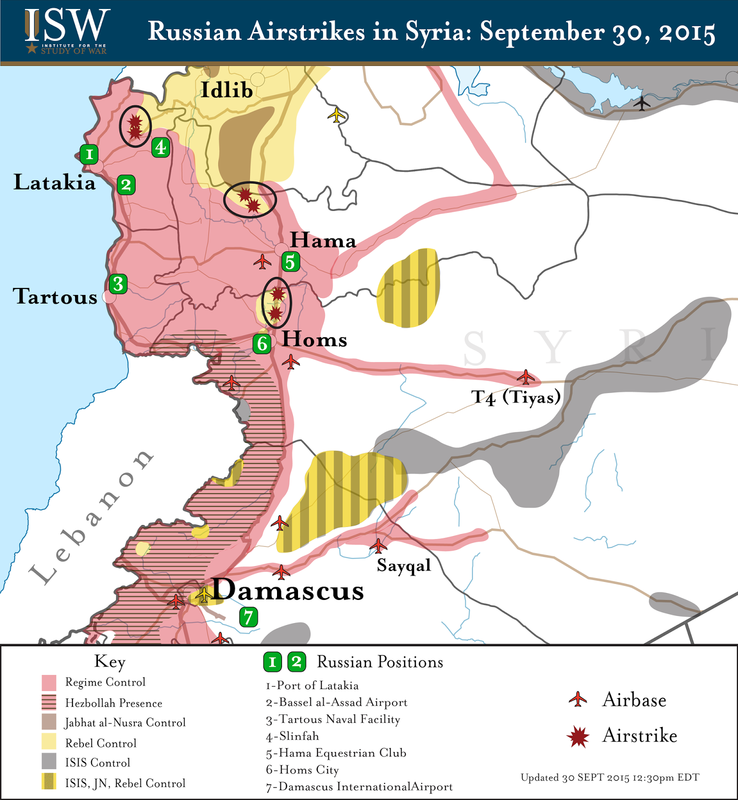 But until we see exactly where this is going, it could still be seen as a Russian rescue effort for Asad, creating a Russian-protected area in the Asad heartland, and not necessarily a direct challenge to the US and coalition air campaign. It mostly depends on what those Su-30s are intended for. As previously noted, all the Abrahamic religions have a busy week. The Meccan hajj began today and the ‘Eid comes later this week; Yom Kippur starts at sundown, and Pope Francis just landed here in Washington to begin his US tour. Greetings to my Jewish readers on the occasion of Yom Kippur. An easy fast. My recent pace of posting has been slow due to deadline, but should improve soon. The recent incident in which Egyptian police and security forces mistakenly attacked a party of Mexican tourists and their Egyptian guides, killing 12, drew sharp protest from Mexico. MadaMasr has an interesting comparison of the very different media coverage the incident received in the two countries' respective media outlets: "Timeline: How Egypt and Mexico communicated the Tourist killings." I'm very busy with our Fall issue but want to address one question I haven't seen discussed very much. There has been a lot of discussion about the fact (or factoid) that the GCC states have not accepted Syrian refugees, unlike other Arab neighbors. Some of the criticism has been fair, and some unfair, such as posting photos of the Saudi tent city for Hajj pilgrims and saying these tents are standing empty. Since the Hajj is next week I'm sure they're filling up fast. Several days ago (on September 11 to be exact), the Saudi Ministry of Foreign Affairs insisted that not only was it hosting Syrian refugees, but that it was hosting no fewer than 2.5 million. The statement, posted by the Saudi Embassy in Washington, can be found here. The Kingdom has received around 2.5 million Syrians since the beginning of the conflict. In order to ensure their dignity and safety, the Kingdom adopted the policy not to treat them as refugees or place them in refugee camps. They have been given the freedom to move about the country, and those who wish to remain in Saudi Arabia (some hundreds of thousands) have been given legal residency status like the remaining residents. Their residency comes with the rights to receive free medical care, to join the labor market and to attend schools and universities. This was contained in a royal decree in 2012 that instructed public schools to accept Syrian students. According to government statistics, the public school system has accepted more than 100,000 Syrian students. Pro-Saudi apologists have touted this and critics of the Kingdom have expressed questions, but hardly anyone has raised an issue of who, exactly, these Syrians may be. Northwestern Saudi Arabia is still a largely tribal area, with significant portions of the non-urban population either true nomads or transhumants who shift their livestock between summer and winter pasture. These tribes are trans-national and sometimes have dual nationality if their winter and summer camps are on opposite sides of the boundary lines drawn with a straightedge ruler at the end of World War I. Unless there is a suspicion of a security threat, the nation-states rarely interfere with the semi-nomadic lifestyle that has persisted since ancient times. One of the best known of these is the large tribal confederation of the Shammar, who may number as many as four million and are found in Saudi Arabia, Iraq, Syria, and Jordan. The Arabian branch of the Shammar, under the Rashid ruling family, were once the main rivals to the House of Saud. The true nomadic and seasonal transhumant elements among these tribes have routinely crossed map boundaries with near impunity. 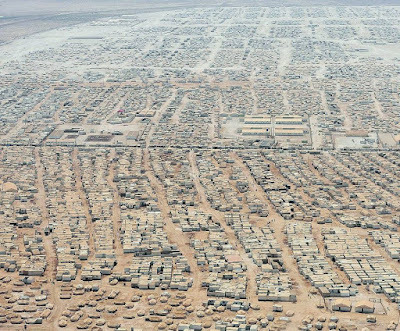 So my question is: what proportion of the Syrian refugees in Saudi Arabia are Bedouin who simply moved across the border to escape the war in Syria by joining their tribal kin in Saudi Arabia, or perhaps even migrating to their seasonal grazing pastures? I'm not sure it matters, and bravo to the Saudis for accepting them, but most of the responses to the Saudi statement haven't noted this aspect. 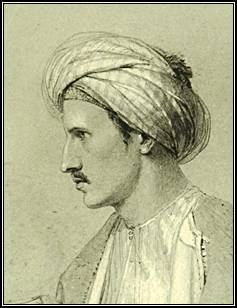 The great pioneer anthropologist and lexicographer Edward William Lane was born on this day in 1801, as I believe I have noted every year since I started blogging. Lane's works, cited fully in the link above, give us a superb description of Egypt in the Muhammad ‘Ali era, while his Arabic-English Lexicon remains unmatched in English for Classical Arabic. I annually note his birthday for those reasons and because I share the date, though I am rather younger than he. 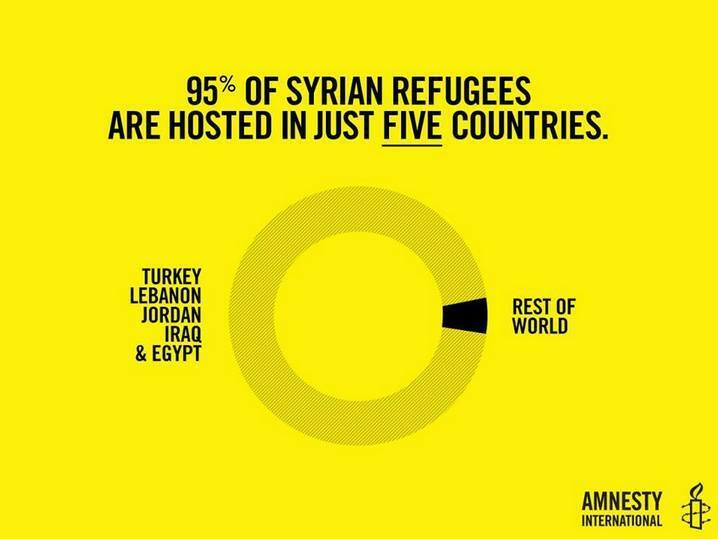 Nearly a Quarter of a Million Syrian Refugees Are in Iraq. How Desperate Must You Be to Consider IRAQ a Refuge? For those critical of the refugee influx in Europe this is a reminder that the bulk are still in camps in the Middle East. 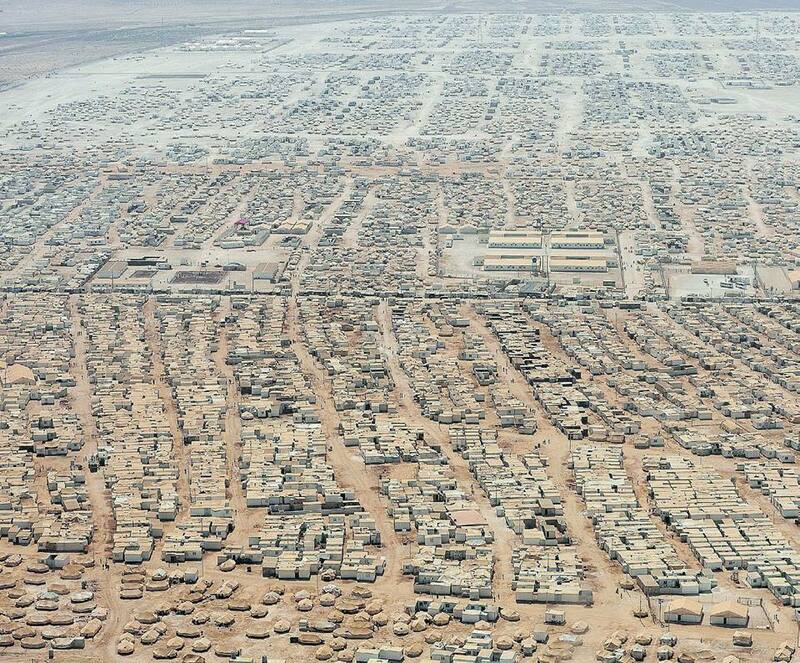 I continue to be astounded that nearly a quarter of a million Syrians have fled to IRAQ. Attention: all those Western journalists on the Serbian-Hungarian border: does it only become a story at an EU Frontier? I thought I'd note an interesting fact about next week. At sunset on Tuesday, September 22, the Jewish Day of Atonement, Yom Kippur, will begin. Just 24 hours later, at sundown September 23, the Muslim ‘Eid al-‘Adha begins, the Feast of Sacrifice culminating the Meccan Hajj.. Though both the Jewish and Muslim calendars are basically lunar, the Hebrew calendar periodically adds an intercalary (extra-calendrical) month to bring the lunar calendar closer to the solar, while the Islamic calendar expressly forbids this and is purely lunar. So this near juxtaposition of two of their major holy days is purely a coincidence, but I suspect security services will be on alert in Israel, the Palestinian territories, and around the world. There are no major Christian feasts next week, but it happens that just a few hours before Yom Kippur begins in the Eastern United States, at 4 pm Eastern Daylight Time next Tuesday, Pope Francis will land in Washington for his first visit to the US, visiting DC, New York, and Philadelphia. It will be a busy week for all the Abrahamic faiths. I'm deep into our Fall issue and blogging will be light this week. More soon. First Vanunu, Now This: Revisiting the 1979 Vela "Double Flash"
Perhaps because of the Iranian nuclear agreement, there seems to be increased discussion of Israel's nuclear arsenal. Eyebrows were certainly raised when Mordechai Vanunu, long imprisoned and then forbidden to speak publicly for revealing details of Israel's deterrent, was interviewed on Israeli television on Septmber 4 and allowed to speak freely. That raised the question of whether the Israeli security establishment is prepared to be more open about its capabilities. Now, Leonard Weiss revisits another old debate in the Bulletin of the Atomic Scientists: "Flash from the past: Why an Apparent Israeli Nuclear Test in 1979 Matters Today." For those who came in late, on September 22, 1979, a US intelligence satellite tasked to look for evidence of atmospheric nuclear testing, Vela 6911, detected a double flash where the Indian Ocean and Atlantic come together off South Africa. The double flash was characteristic of a nuclear explosion. It was speculated that it was either a South African test with Israeli assistance, or an Israeli test from a South African ship. (They were known to be cooperating at the time.) The US National Laboratories and the US Intelligence Community were convinced that it was indeed a nuclear test, but a scientific panel appointed by the government eventually declared the results inconclusive. Those familiar with the intelligence largely remained convinced it was real but the public perception was that it had been inconclusive. Weiss's article revives the debate and reviews the evidence, allegations, and rumors. It's worth reading whether you're new to the debate or already familiar with it. Greetings to my Jewish readers for Rosh Hashanah, which began at sundown. But while the memories will endure, it is also disturbing to realize how much the violence of that day 14 years ago still echoes. Afghanistan still struggles; Iraq, which had no ties to 9/11 but which we invaded anyway, may be destroyed, and the regional chaos has devastated Syria and crippled Libya and Yemen. Not all those events stem from the 9/11 attacks directly, but neither are they unrelated. As we remember, it remains important to discern that in some cases we may have learned the wrong lessons from that dark day. The collapse of a construction crane a the Grand Mosque (Masjid al-Haram) in Mecca just 10 days before this year's hajj is likely to spur concerns about pilgrim safety, given the huge construction efforts underway in and around the Mosque. At least 87 dead are reporting and the number may grow. The massive construction projects have been controversial both within and outside of the Kingdom, involving as they do massive expansion and modernization of the holy sites as well as ambitious projects such as the world's largest hotel, which will dominate he skyline of the Holy City. Pilgrim safety has frequently been an issue in the past given the huge crowds assembled. It is unclear how much damage was done to the structure of the Mosque itself. As the World Freaks Out About Russian Troops in Syria, Has Anybody Noticed Qatar and Morocco are Sending Ground Trrops to Yemen to Join the GCC Forces Already There? The Russian buildup in Syria has produced a lot of media attention and expressions of concern, but Syria isn't the only war attracting foreign military intervention. Within days of the death in Yemen of 45 UAE troops (along with 10 Saudi and five Bahraini troops), Qatar announced that it was deploying 1,000 ground troops to Yemen to join the Saudi-led coalition there, its first dispatch of ground troops there, and Bahrain's King Hamad announced that two of his sons would go to Yemen as part of their national service. All of the GCC states except for Oman are now participating in the Yemen coalition, and with the Qatari deployment all will have ground troops in Yemen except Kuwait, which is contributing aircraft. Egypt, Jordan, and Sudan are also participating militarily in various ways, and now there are reports that Moroccan ground troops will also be joining the coalition. Reports suggest that up to 6,000 Sudanese troops may be coming as well. At a time when it is still not clear whether the Russian buildup in Syria is intended to participate in combat or is merely there for force protection and regime protection, it is interesting that there is much less attention (at least in the US media) to the growing ground force commitment in Yemen. An Egyptian Novelist Writes About How Learning Hebrew "Teaches Us Something About Ourselves"
Egyptian novelist Nael El Toukhy, who reads and translates Hebrew, has written a series of five articles on "How Hebrew Teaches us Something About Ourselves." It appeared in five parts in Arabic earlier this year on MadaMasr, and is now appearing in English. Thee first three parts have now appeared in English at the MadaMasr site: Part I; Part II; Part III. 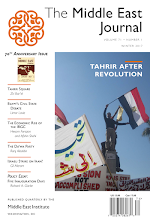 Each English article also carries a link to the original Arabic. You can already find the Arabic versions of Part IV and Part V, and I assume those parts will soon appear in English as well. It's worth a read for anyone interested in either or both languages. In my ongoing recounting of some largely forgotten sidelights of the centennial of the First World War in the Middle East, we have several times looked at the circumstances surrounding the British occupation of the Iranian port of Bushire (Bushehr) and its hinterland in 1915. In July we discussed the first attack on the port by Tangistani rebels, and in August the occupation and destruction of the Tangistani base at Dilwar (Part I and Part II). The final act of the Tangistani conflict took place in September, culminating in a battle at Bushire on September 9, 1915, a century ago today. The earlier posts describe the essential background. 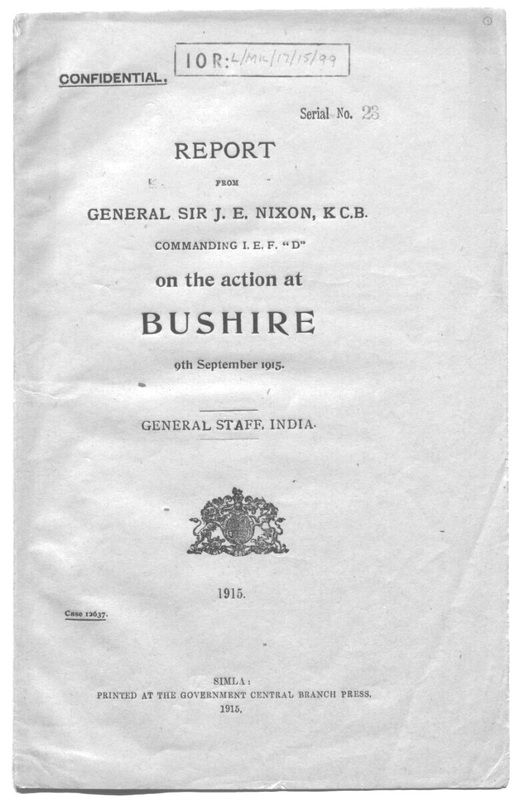 Once again this narrative is largely drawn from the India Office Records digitized through the Qatar Digital Library, mainly "Report from General Sir J E Nixon, K C B, Commanding IEF 'D', on the action at Bushire, 9th September 1915," as well as official histories. 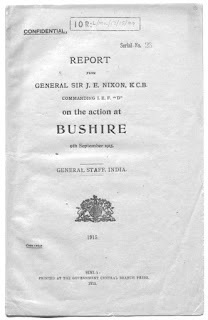 In August he British Indian Army garrison at Bushire, originally made up of the 96th Berar Infantry, was reinforced with elements of the 11th Rajputs and a squadron of the 16th Cavalry. Brigadier General H.T. Brooking was the new garrison commander, backed up by a naval force headed by the Senior Naval Officer, Gulf, Captain Drury St Aubyn Wake, who was introduced in the earlier installments. 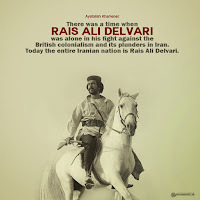 During August the Tangistani rebel, led by the charismatic local Khan, Ra'is ‘Ali Delvari, had been probing the British defense lines at Bushire. On September 3 they launched an attack which was quickly beaten back, but in the fighting Ra'is ‘Ali was killed, reportedly assassinated by a traitor among his own men. 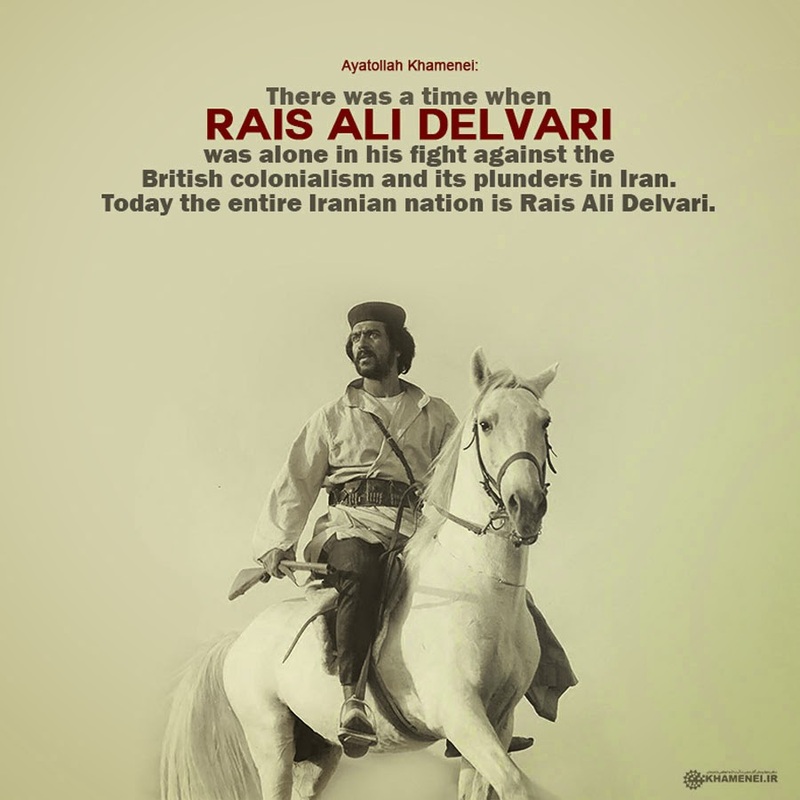 Thus by the time of the main attack on September 9, the Tangistanis had lost their leader.Though the British considered Ra'is ‘Ali as little more than a brigand Iran today honors him as a hero of anti-colonial resistance, and his house is now the Delvar Ethnological Museum. The main attack came on September 9.The British reported the enemy advancing through nullahs (wadis or ravines, an Indian term), and across the mashila or low-lying tidal area between the Bushire peninsula and the mainland. Fortunately for the British, a Naval Landing Party and a unit of Royal Marines from HMS Pyramus were shore for training purposes. During the early fighting, the Indian troops found themselves struggling to advance, but Brooking ordered naval gunfire from Juno and Pyramus and sent in his reserves, including the Royal Marines and Gurkhas he had held back finally breaking the lines with a bayonet charge The 16th Cavalry were then sent forward on to the mashila in pursuit. Brooking reported 43 enemy dead on the battlefield, 14 wounded and four non-wounded prisoners. 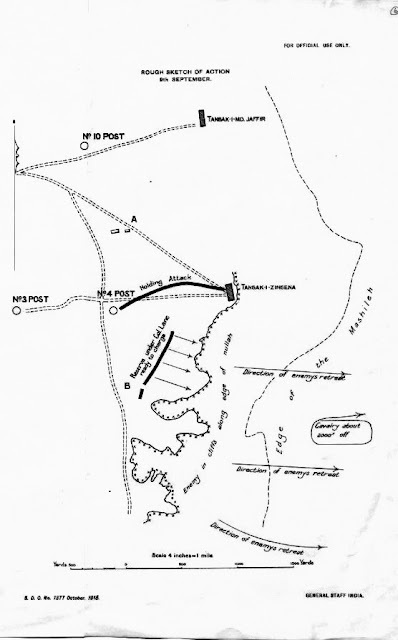 British losses included a British major and second lieutenant killed and another second lieutenant died of wounds, two Indian cavalry officers, two seamen, and 25 Indian rank and file dead, and multiple wounded. 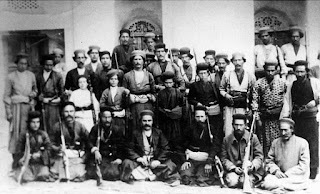 Te death of Ra'is ‘Ali ended the immediate Tangistani threat, though tribal resistance to the British occupation would continue throughout the war. I've noted The American Schools of Oriental Research (ASOR)'s Syrian Heritage Initiative in the past. The latest of their Special Reports is here: "Special Update on the Situation in Palmyra." For previous Special Reports on Palmyra and other threats to Syrian heritage, see here. Not since the end of World War II and the mass displacements then, and two years later after the partition of India and Pakistan, and the Chinese Civil War, have we seen such massive human displacements as we are seeing today, not just the Syrian refugee crisis, though that is the most acute, but the ongoing flow of Sub-Saharan Africans, Somalis, Libyans, and others seeking to flee across the Mediterranean to Europe. And if the map below is accurate, nearly a quarter of a million Syrian refugees are now in Iraq, which suggests the level of desperation. Now the map clearly shows that not every country in the Middle East is opening its borders, and this is a justifiable reason for criticism. But if some of the richest countries are turning a blind eye, others, particularly Turkey, Lebanon, and Jordan, are bearing the burden. There is an irony in the fact that the Gulf states are not yet shouldering a share. 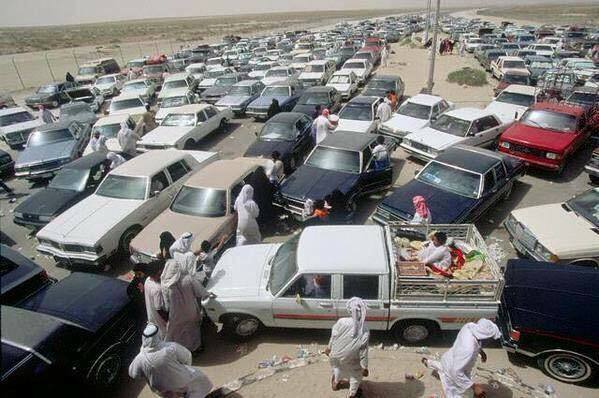 When Iraq invaded Kuwait in 1990-1991, many Kuwaitis sought refuge elsewhere. The photo below is said to show Kuwaiti cars backed up at the Syrian border in 1991 (I cannot verify the identification), but Syria did open its borders to Kuwaiti refugees at the time. Kuwait has yet to return the favor. The massive deaths and displacements of the 1930s and 1940s from Europe to China are the most recent precedent for the scale of human migration we are seeing today, though there are others (Indochina in the 1970s, Africa more recently) that are more recent. But unlike, say, the example of Kuwait in 1990-1991 mentioned above, the present migrants are unlikely to be going home anytime soon.These may be long-term refugees, like the Palestinians or the population exchanges accompanying Indian partition. As a descendant of Irish who fled to the New World during the Great Famine, and of Ulster Scots who fled rack-renting a century earlier, I can attest that migration is a constant in human history, and not always a bad thing. But we seem to be dealing here with an issue of scale. Again, it is not just Syria. Iraq and Libya and Yemen in the Middle East are also seeing outflows, as is sub-Saharan Africa. Völkerwanderung on that scale, but we do face a global challenge and global challenges should not be met with narrow national responses, driven by domestic politics, but by a genuine sense of global responsibility. Today is the Labor Day holiday in the US. Blogging will resume tomorrow. The Saudi and GCC campaign in Yemen, which increasingly involves ground troops fom the Gulf countries, gets little attention in the West. But the death of 45 Emirati troops in a single operation, from a missile strike by Houthi forces, has shocked the Emirates, which has little previous combat experience. Three days of mourning have been declared. Previous Emirati and Saudi casualties in Yemen have been a few at a time, easily shrugged off Such a large death toll in one day is a reminder to the UAE and the rest of the world that the Yemen operations are ongoing. The troops, from the 107th Brigade, died when a Houthi missile struck an ammunition depot in the Marib area. I don't usually comment on US politics, but :"Donald Trump Stumbles and Bristles During Foreign Policy Interview." Quds and Kurds? Same thing. Hasan Nasrallah? Nah. Ayman al-Zawahiri? Nah. Abu Bakr al-Baghdadi? Nah. (Maybe he knows him as Caliph Ibrahim?) Qasim Suleimani? Nah. He does say he hasn't had occasion to meet these people yet. I guess it would be more worrisome if he had. The Power of an Image May Grab Our Attention for a Day, But What of Tomorrow? The heartbreaking image of a drowned Syrian toddler washed ashore on a Turkish beach is all over the media today, including much of the Arab media. Out of respect for the dead I see no need to reproduce it here, but for a while at least it is calling attention to the plight of the refugees and the immense human tragedy that is intensifying. Much outrage is being expressed in the Arab media. 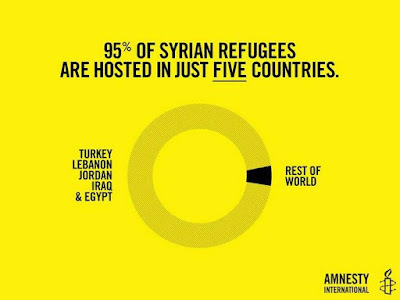 Yet outside of Lebanon and Jordan, few Arab countries have been welcoming to refugees and those two plus Turkey are at saturation point. Egypt has accepted some, though it is harder to reach. 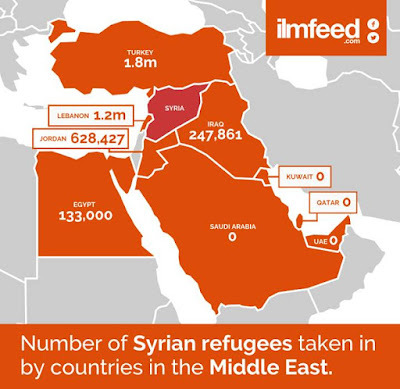 The countries of the Arabian Peninsula, who have in various ways helped stir the pot in Syria, have done little for the refugees. Europe's response is obviously mixed. The image of a dead child will no doubt, for a time, increase charitable contributions to refugee causes. But a month from now a year from now will anyone still remember? The sheer enormity of the disaster boggles the mind, but a photo today touched the world. For a moment. But will anything be done? By the end of August 1915, the last sputtering efforts of the British "August offensive" at Gallipoli had ended in a mix of British confusion and Turkish successes. Though two more units would be landed as reinforcements in September, Britain had shifted to the defensive. The Gallipoli campaign had failed By November it would be decided, after a visit by Lord Kitchener, to pull out, but fears of massive casualties made this a slow process, and the last British troops were not removed from Turkish soil until January 1916. Casualties were kept relatively low after the failure became apparent, except at the senior level: General Sir Ian Hamilton would be relieved in October, and his advocacy of Gallipoli would haunt Winston Churchill's career for decades. But the increasingly obvious failure at Gallipoli would not be the only bad news for Britain in the Middle East. In Mesopotamia the British were overextending their Mesopotamian campaign, a mistake that by the next year would lead to their disastrous surrender at Kut. Even more critically, in October 1915, Bulgari would enter the war on the side of the Central Powers opening up an overland line of communications between Germany and Austria-Hungary and the Ottoman Empire, and facilitating rearming the Turks. British fortunes in the Middle East were clearly on a downturn a century ago. It's been a while since I've had a linguistic post, but one of the best linguistics bloggers out there, Algerian Lameen Souag at Jabal al-Lughat, had a productive August with numerous posts relating to Algerian Arabic (as well as a few ion other issues in Berber and Songhay). Since the whole colloquial vs. literary issue is a frequent topic here, all the Algerian Arabic posts are of interest as is one on the Arabic vs. French issue..
"Can Two Kids Change Algerian Arabic? (Probably Not, But Let's See.)" "Algerian Arabic in schools? More smoke than fire." "Algerian Arabic in schools? Actions speak louder than words." "Discrimination against Arabic in Algeria?" This is about Francophone bias, the other big linguistic issue in Algeria (alongside classical/Dardja and Arab/Berber). Lameen does note, "Attention conservation notice: The story below is probably being promoted as a distraction, to keep Algerians talking about language instead of about what happens when a succession crisis combines with a fall in oil prices, in a state almost entirely dependent on oil revenue. Nevertheless, while not the most immediately pressing problem facing Algeria, it deserves attention on this blog."